Nest made its name with a smart thermostat which, arguably, kickstarted the current wave of interest in connected home products. Since then, it's largely concentrated on security cameras, with Drop Cam (Nest purchased the brand in 2014), Nest Cam and Nest Cam Outdoor. And now, there's the £299 Nest Cam IQ, shipping in late June in the UK. This is undoubtedly on the absolute cutting edge of connected home cameras. Should you buy one? Eh… Probably not, given that much cheaper devices give the same key benefit. For those not quite sure what sort of camera this is, the Nest Cam IQ is one of a growing breed of web-connected security-focussed video cams. It constantly uploads its video feed to the cloud, and thence to your mobile phone. It offers alerts when certain actions occur (people appearing in shot, most particularly), and you can also access the feed manually at any time. The sensor used is an eight-megapixel, 4K job, lensed to give a 130 degree field of view. Instead, the video is stepped down to 1080p. However, having a 4K sensor is not as pointless as it sounds. The higher initial resolution and HDR mean the 1080p footage you see is noticeably crisper. It also allows for much more detailed zooming, up to a maximum of 12x, so you can not only see that someone is stealing your laptop from your lounge, you can also identify that it's the guy from the pub who's always smoking the massive vape. The higher resolution also gives a big potential element of future proofing, for when 5G mobile connectivity comes online, or some other future development makes 4K streaming less burdensome. Yes, we know you can recognise people, but for a smart camera, this is a big deal. Where some standard cameras look for movement and alert you, regardless of whether that movement is a cat, a plastic bag blowing past the window or even a shadow shifting as the sun moves, Nest Cam IQ knows when it sees a person. Better still, it will automatically zoom in on and track them, making full use of that 4K pixel count. That way you can tell if it's your spouse, flatmate, Hamburglar, Hannibal Lector or Dracula. Nest calls this Supersight: showing an HD, 130-degree view of the room, and a close-up tracking view of the person in the home, in a picture-in-picture format. You can click on either element to enlarge. Add a Nest Aware subscription (£8 per month or £80 per year) and you can make use of facial recognition, so the Cam IQ not only knows it's a person, it knows who they are, or at least that it's seen them before. You just need to add names to the faces it shows you. It is not true to say this feature is unique to Nest Cam IQ – Netatmo, notably, has been pushing it for years – but with Google's faintly terrifying face-recognition software underpinning it, Nest's application of it looks sound. A pair of 940nm infrared LEDs gives the Night Vision beloved of security professionals and stalkers, but without alerting visitors to your home – there's no visible, reddish glow with this type of infrared light. Nest Cam IQ's speakers are '7x more powerful than the original Nest Cam'. Add an array of three noise-suppressing mics and you have clear, two-way communication between your mobile device and the camera. Hence you can listen in on your sleeping baby, tell your partner you're on your way home, and ask burglars if they wouldn't mind awfully putting that PlayStation down and leaving the area. 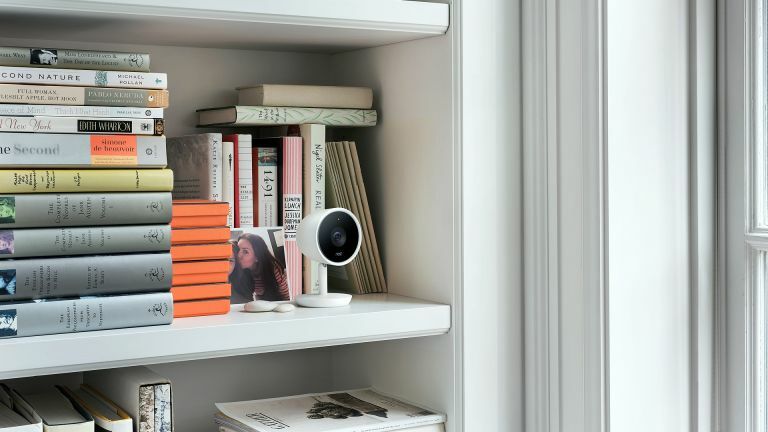 By contrast, Nest Cam IQ boasts on-device encryption, 128-bit AES with TLS/SSL secure connection, two-step verification of your identity and automatic over-the-air security updates. Well, given that Nest Aware costs £80 per year, it should. The benefits include the aforementioned familiar face alerts, but also intelligent audio alerts, so it'll listen out for people talking or even dogs barking – at an intruder, for instance, or the sofa. At just shy of £300, the Nest Cam IQ is almost double the price of the previous leading-edge, smart home security cameras (as opposed to more traditional security cameras, which are managed and monitored by the company that supplies them). Yes, it gives you better video footage, but it's questionable that it detects intruders any better than rivals such as Netatmo Welcome, Logitech Circle and, er, Nest Cam. Given that it's an internal camera, and not tied into an alarm system, the deterrent benefits of this (and most similar cameras) are questionable, to put it mildly. And finally, in the UK, if you don't catch a burglar literally in the act, it would appear the police are increasingly unlikely to attend the crime scene. This raises the question of whether you should rush home to defend your property – not a prospect that fills most people with joy, let's face it. On the plus side, the higher resolution footage, zoom functionality and smart face tracking employed by the Nest Cam IQ could definitely make an intruder more identifiable, and subsequently more prosecutable.